Sophsterlicious • UK Blog: Loving .. Eye of Horus Smokey Eye Pencil. I love eyeliner. I love trying new eyeliners and comparing them to the current fave eyeliner that I am using, whatever that may be. It's like a never ending search for a perfect smudgy, black, long lasting, waterproof eye pencil that stays on the waterline. This smokey eye pencil* by Eye of Horus (a brand which is new to me) is an excellent eyeliner choice. As you can see from the swatch above, it is the blackest of black, and to add to that, it smudges really well (with the smudger on the other end of the pencil), but you have to be quick because once it sets in place it ain't going anywhere for a while. This is very possibly the blackest liner I own and the one that lasts the best on my waterline. Up until now I've been trying out all sorts, which were good - but not quite as good as this one. .. 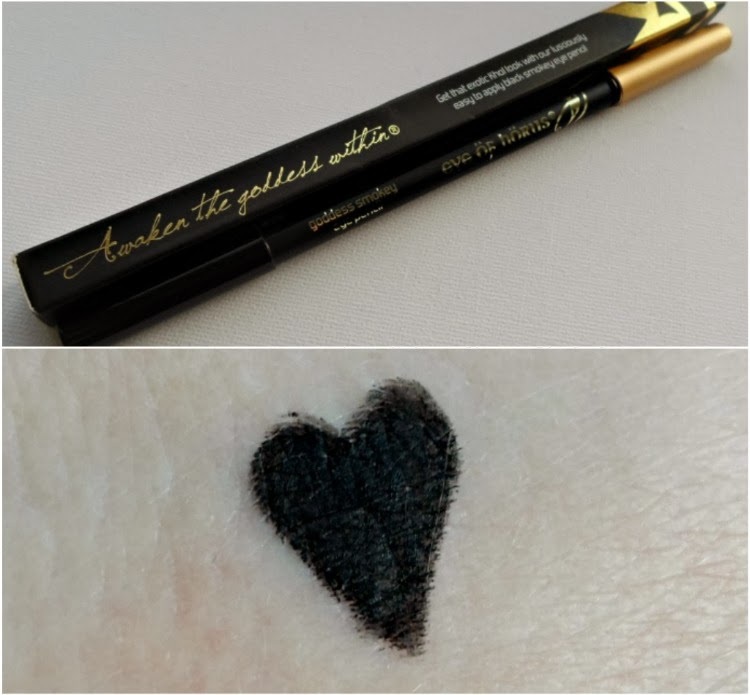 The smokey eye pencil from Eye of Horus is uniquely formulated with Jojoba Wax and Mango Oil, and is 100% waterproof, so it glides on without tearing and stays on without imprints on eye lids. Perfect for day wear to accentuate eyes, or evening wear to get that sensual smokey look. Smudger on tip allows to define or smoulder as much as you like. Due to the beautiful natural soft waxes and oils in the smokey eye pencil, a high grade cosmetic sharpener must be used to sharpen, clean and maintain the integrity of the pencil. Paraben free .. So, I really like it, a lot. This brand is Australian, but it's available in a few online shops. If you do a Google search, you'll see. They're a little pricey, but judging by the quality of this liner, they're well worth it. This liner is available from Eye of Horus, or here here for £13. WOW. That is so inky black! I need for smoky eye looks lol.